Secluded vibes, yet easily accessible terrain . Pristine tree skiing and intermediate groomed terrain. ● Timberline Catwalk to Flapjack: While Northwoods doesn’t have a vast range of beginner terrain options, Timberline Catwalk offers guests one of Vail’s very best views in to the back bowls, over to the impressive Gore Range and across the front side of Vail Mountain. So if you’re a new or modest skier, don’t miss this one of a kind view and easy, rolling groomer. 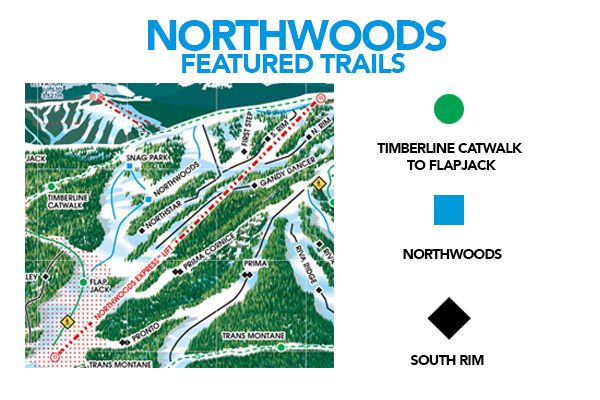 ■ Northwoods: The central trail on one of the most beautiful and wooded areas on the mountain, Northwoods lives up to its name. Tucked away in a thick grove of trees, the Northwoods’ areas namesake run is the perfect lap for any intermediate skier looking to explore the trees. ◆ South Rim: South Rim is a short, but steep pitch just below the top of Chair #11. Be aware, South Rim is not for the faint of heart. Either choose to make your turns down the open field or through the loosely spaced trees to skiers left. Continue to ski the Chair #11 liftline for some of the most fun expert terrain on the mountain. Here are a few of our favorite social media posts and shots taken in Northwoods.